Banana plants appeal to the imagination. They are also fairly common to find in the local garden centre as the Musa basjoo is gaining more popularity. 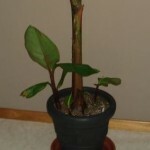 Many people are still somewhat reluctant to actually buy a banana plant. However, in terms of care they are not at all so difficult. If you still having troubles, then you will surely find the solution here. First of all check the humidity of the soil. 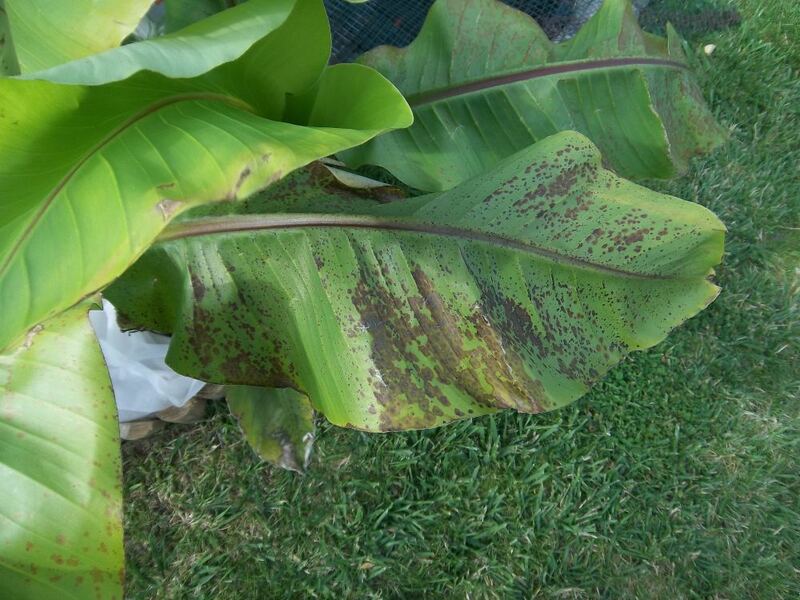 In summer the banana plant likes a lot of water and fertilizer. During winter, however, it must be kept relatively dry. Do not only limit yourself to the top layer, but also check deeper into the pot. If necessary, take the plant out of the pot. The difference can be amazing. Excess water must in any case be able to flow away. 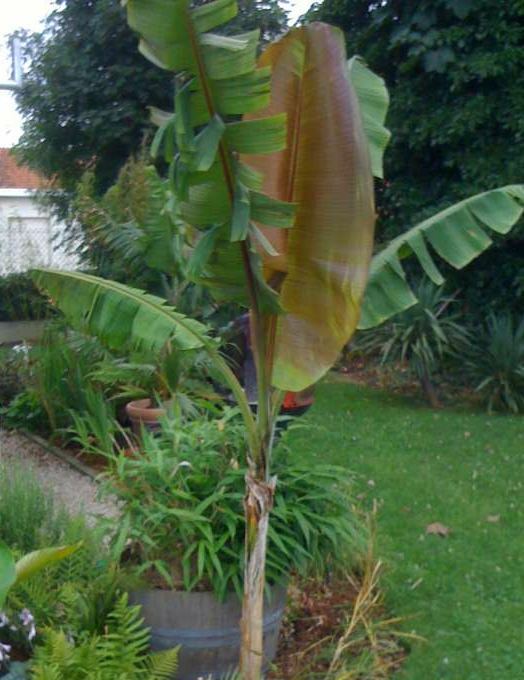 Cocopeat (often used by nurseries) is not suitable as a potting soil, because it contains too few nutrients for the banana plant. Solution: Adjust the conditions if necessary. Carefully check the leaves for the presence of undesirable residents. Honeydew (a sticky transparent substance) indicates the presence of lice. 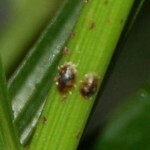 Ants on the petioles can also indicate that lice are present. The ants are feeding on the lice. Scale insects, small flat brown insects, are quite difficult to detect. Watch leaves with honeydew inch by inch, from the top to the bottom. Spider mite is barely noticeable with the naked eye. In places where they group together, detection should be easier. Therefore, especially look at the bottom of the leaf along the veins, the leaf tips and the petiole. 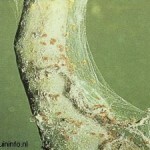 Spider mite also produces typical woolly spider webs in those places. Mealy bugs look like white mold flakes that from close up look do look like white woodlouse. Solution: Treat the pest with a dedicated chemical product. The local garden centre has enough appropriate products in their assortment. Biological variants are usually slightly less effective and are therefor less ideal for such persistent problems. Indoors, humidity can also be a problem. Especially during the winter months when the central heating is on. Solution: see Air humidity too low? This is how you solve it! 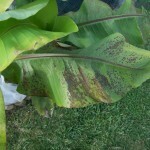 Black stains on the leaves often occur in the case of bananas outside in combination with cold and wet weather. Normally the new leaves are beautiful again when the weather gets warmer and drier. 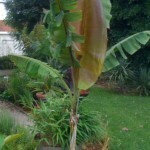 The large leaves of banana plants tear up quite quickly in the wind. Unfortunately, this is not avoidable, but fortunately it does not cause a problem for the plant. During the peak season, growth can be quite fast. 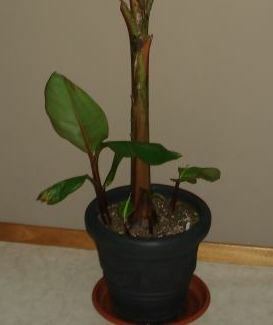 Every few days a new leaf is not unusual in case of a well growing banana plant. It is therefore possible that a new leaf rises already when the previous one is not even completely unfolded. Normally this problem solves itself. Only when the plant keeps repeating this phenomenon and the different leaves are really in the way of each other there can be a blockage. Solution: The solution in case of a blockage is simple but rigorous: decapitation of the plant. Cut the stem horizontally just below the leaves. This will also cut off the blockage. The plant is of course temporarily leafless, but thanks to the rapid growth, nothing is visible after a short time. The banana plant will simply continue to grow from this point onwards. Droplets on the leaf tips are quite normal. This phenomenon is called guttation. See Why are there water drops on the leaf tips? 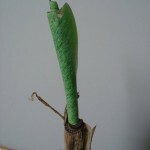 It is quite normal for the plant to form offshoots alongside the principal stem over time. Solution: If wanted you can cut these offshoots to pot them individually (see: Banana plant multiplication) You can also just let them grow next to the mother plant.